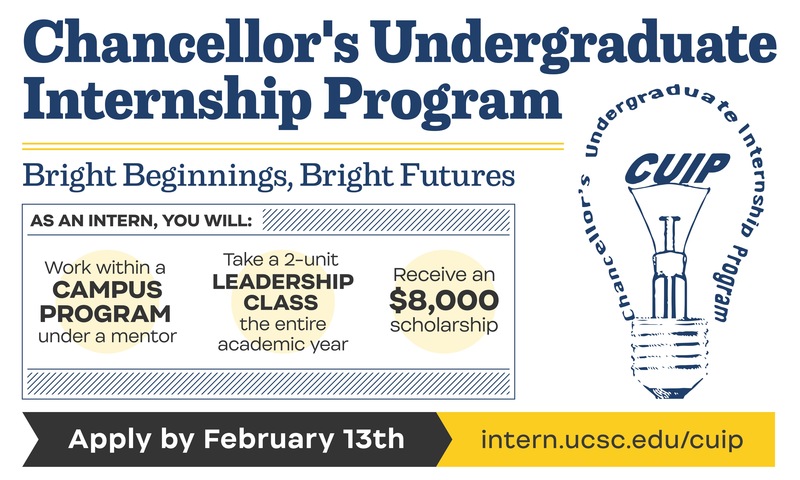 The Chancellor’s Undergraduate Internship Program (CUIP) provides full-time students the opportunity to learn valuable professional skills while supporting student resources. Interns work within programs and departments throughout the university, and attend a two-unit leadership seminar during the academic school year. With direct support from mentors, they will conceive, develop, and execute a project applicable to their post. Interns earn an $8,000 scholarship for the academic year. You can see a list of all positions here. You may apply to up to 4 internships. Once you are signed into Handshake, you must complete this survey before you can apply to any of the internships. You only need to complete it once, and they will all open. If you have not completed the survey you will see a notification saying, "Your school has restricted your ability to apply to this job. Please contact them to learn more about this restriction" until it is complete. Student applications due - Wednesday, February 13, 2019!!! We highly encourage students to come to the Career Center to ask questions (CUIP Office Hours: Mondays and Wednesdays 2PM - 5PM and by appt) and/or review their application with peer advisors during drop-in advising.